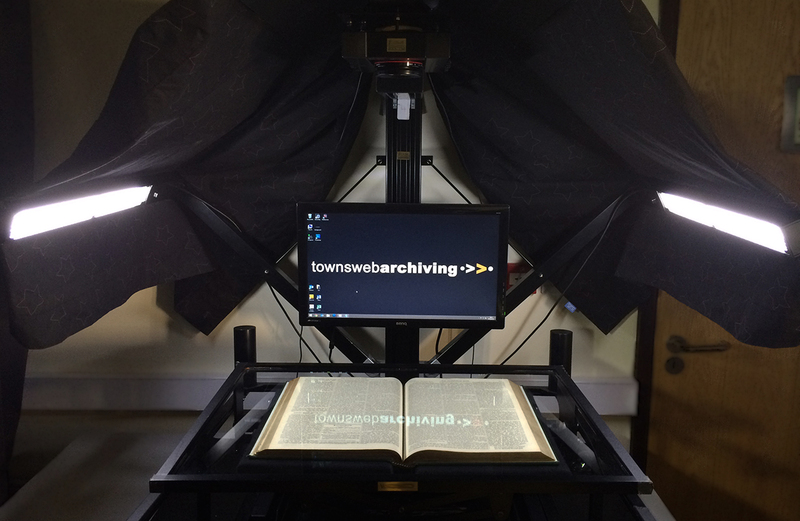 Following the popularity of our How to Digitise Photograph Collections blog post, in the second of our “How to digitise…” series we share our best practice tips for scanning bound books. Our specialist technicians have digitised books of all shapes and sizes, from standard leather-bound volumes, to Guard books and large format burial registers. As a result of this experience, they know all of the key media-specific challenges that arise when digitising bound volumes. 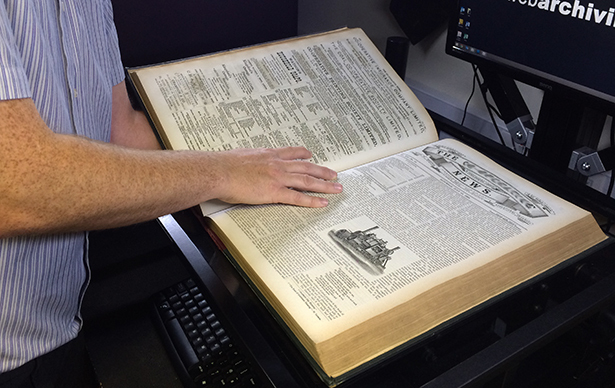 Checking the condition of the books that you are considering digitising to ensure that they are in a suitable state to withstand the scanning process is a vital first step. The books should be assessed for general fragility and brittleness, mould, and other signs of damage. If any of these are found to be present on a particular volume, it may be unsuitable for digitisation and need to undergo conservation processes to repair/stabilise it before being scanned. Binding presents one of the biggest challenges when digitising book collections. Even moderately tight binging can cause curvature around the gutter (area between two pages) of the book and create distorted scans, particularly distorting text near the gutter. This curvature tends to be more prominent in thicker volumes and can present a significant problem if you plan to OCR the text from the digital images at a later stage. The curvature can be minimised through the combined use of adjustable book cradles and a low pressure glass screen (assuming a Book or Planetary Scanner is being used), to flatten the pages as much as possible without placing stress on the book. The curvature caused by binding can also prevent light properly reaching the gutter area in some cases, resulting in dark areas in the scanned images. This can usually be mitigated by rotating the book so that lighting is projected along the gutter rather than across it (as illustrated in the image below). Incandescent (or heat producing) lighting can damage the paper and dye/inks of archival books (and other paper-based media). Specifically, it can cause the paper to fade or darken, as well as causing it to become brittle due to breaking down the cellulose fibres that make up the paper. To mitigate potential light damage to the bound volumes, only fluorescent or LED (light-emitting diode) lighting should be used to illuminate books during scanning. This lighting produces far less heat and infrared energy. As when handling any old, rare and fragile archival media, bound volumes should be handled with care whilst preparing them for and carrying out the digitisation. For many collections, the digitisation process can be the most the books have been handled in a long time and it may have been years since every single page was turned. This increased handling can accelerate the normal process of wear and tear if not done carefully. We do not recommend wearing cotton gloves when digitising books as these can reduce dexterity, resulting in less delicate turning of pages and a greater risk of damage. In addition, there is a risk of fibres from the gloves catching on the delicate page edges and causing damage. For full guidelines on handling archival materials, including bound volumes, take a look at this advice from The National Archives. As we have noted in our previous best practice post on planning for digitisation, the resolution and capture format you choose will depend on the goals of the digitisation project. However, when planning to digitise book collections for our clients, we normally recommend scanning to produce 300ppi uncompressed master TIFF image files. Lower resolution, compressed surrogate JPEGs can then be produced from the master images to create Adobe PDF eBooks, or for display as thumbnails on the web or within digital archive management systems. It is also worth noting that organisations and charities that fund heritage digitisation projects often require that images are captured to open-source, non-proprietary formats as part of their criteria for funding a project. Even when starting with precisely calibrated equipment, a book will tend to move slightly over the course of scanning. This normally takes the form of a shift from right to left as the pages are turned. This shift tends to be more exaggerated in thicker volumes, but can be monitored and countered by checking each image as it is captured during the scanning process. More advanced book scanners, such as the ones used by our technicians, feature precise laser guides to allow any movement to be immediately identified and corrected. Dividing the book collection into groups of similar sized volumes before scanning will help minimise recalibration of the digitisation equipment and maximise the efficiency of the capture workflow. It’s important to consider if any of the volumes contain fold-outs (such as in the case of Guard Book collections) when grouping, as equipment may need to be recalibrated to capture these. We believe specialist planetary (or book) scanners (such as the one pictured above) are the best equipment solution for digitising bound volumes, and use this type of scanner to digitise all our clients with book collections. This is supported by JISC, who also recommend planetary scanners for digitising books. Planetary scanners are preferred due to the in-built features they possess, such as the as the responsive low-stress book cradles and adjustable LED lighting mentioned earlier in this article. However, a planetary scanner can cost tens of thousands of pounds (not including the cost of hiring/training a scanner operator). So, unless your organisation already possesses the equipment, in many cases it will likely be more cost effective to outsource the digitisation. Are you looking to digitise your bound books?